Distribution: The California tiger salamander is found in suitable habitat at low elevations throughout California’s Central Valley. Although the species is known to live in Yolo and southeastern Sacramento Counties, it has been not documented in the Natomas Basin, despite the presence of a narrow band of vernal pool habitats along the eastern edge of the basin. Habitat Requirements: California tiger salamanders live in grasslands and open foothills that contain both vernal pools for breeding and mammal burrows for summer refuge. 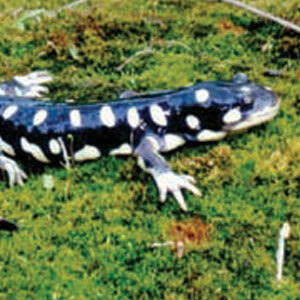 To be suitable breeding habitat, pools must remain inundated long enough for the salamander to complete its lifecycle. Reproduction and Demography: From December to February, when temperatures and rainfall allow the salamanders to move above ground, adults converge at breeding pools filled with winter rains. Females deposit small clusters of eggs or individual eggs on twigs and other underwater vegetation. In two to four weeks, the eggs hatch, and the young salamanders remain in the pool in larval form until metamorphosis is complete, usually by early July. Movement: California tiger salamanders spend most of the year underground in burrows dug by small mammals. Juvenile California tiger salamanders have been found more than 1,200 feet (370 meters) from their birth ponds, while adults have been found more than a mile (1.6 kilometers) from their breeding ponds. Ecological Relationships: California tiger salamanders are preyed upon by wading birds, garter snakes, and other amphibian larvae. Most predation occurs when the salamanders are in their aquatic stage.